Gay Pride, held in San Diego last weekend, was one for the books. Headliner Kesha, who performed a 1 hour and 20 minute set consisting of all her past singles and even her new single “True Colors”, released April,29 of this year, that she collaborated on with the popular producer, DJ and musician Zedd. Candis Cayne introduced the singer who opened up her set with “We Are Who We Are” and the classic “Die Young” on the Stonewall Maine Stage. The set also included 3 outfit changes and crazy cool oversized props like a giant inflatable rainbow, dancing penises, and of course tons of glitter. As well as props, Kesha had lots of whipped cream and beer to rain down on her fans in the crowd. Kesha herself jumped off stage to take selfies with a few lucky fans in the first row. The crowd sung to every word and were high intensity, waving pride flags high for all to see, putting on an epic performance that will be very hard to forget. 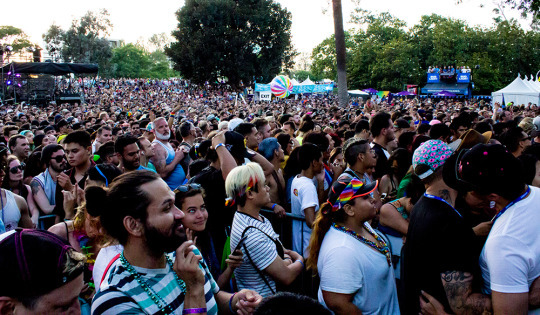 This year’s Pride was the Music Festival’s 42nd year of celebrating LGBTQ rights and consisted of 1,200 volunteers alongside 40,000 Festival attendees and a parade attendance of more then 100,000. As well as thousands of volunteers and guests, the event also had an array of sponsors and free goodies throughout the day. The famous Beer Garden was Sponsored by Budlight and had plenty of entertainment such as corn hole, vollyball, and circular lounging for socializing. Pride was fully equipt with cool zones set through out the festival offering free dasani water and a place to escape the heat.Not only was there free water offered, but there was food as well. Applegatte had you covered, offering free all natural and organic hot dogs and even invited you back for seconds!